When we think of American films we think primarily of Hollywood, yet not one of the scores contained in this collection—the work of one of America’s most distinguished composers—was written for a Hollywood film. Thereby hangs a curious tale. Hollywood’s earliest sound-film composers rarely had the kind of academic or intellectual credentials that Thomson had (Harvard and Nadia Boulanger). The background of men like Steiner, Newman and Victor Young tended to be Broadway or Tin Pan Alley: their context was that of ‘commercial’ music of one sort or another. And ‘commercial’ music is generally conservative in style: Broadway musicals grew out of nineteenth-century operetta; pop songs and light music had to draw on a vocabulary that ordinary people could readily understand and relate to. So with early Hollywood film scores and their composers. Men like Copland and Thomson didn’t fit that mould. Nineteenth-century European romanticism held little attraction for them. They were more interested in the authentic musical past of their own country, in creating a music that was genuinely American, American in its essentials. Hollywood didn’t understand that sort of ‘American’ music, didn’t want it; and, of course, California was so geographically remote from other major American cultural centres that major cultural figures—the Thomsons, Coplands, Bernsteins—could never have worked there on a regular basis, even if they’d been invited. And Hollywood studios were never really happy with ‘moonlighters’: they didn’t fit into the system. The result was that Copland did a mere handful of Hollywood movies, Bernstein only one (On the Waterfront), and Thomson none at all. And there were dozens of other prominent, excellent, American composers who might have excelled in the film-score medium but who, the situation being what it was, never got the chance to try. The films whose music is recorded here were produced independently of Hollywood; and, in the case of the first, The Plow that Broke the Plains, Hollywood was far from happy about it. Conductor Richard Kapp has explained how this and other films of its ilk originated in the attempts of Roosevelt’s ‘New Deal’ government to solve the crushing series of economic problems that beset America in the 1930s, the era of the Great Depression. Underlying the government’s unparalleled participation in subsidizing musicians, film-makers, graphic artists, writers, actors and others was a simple hypothesis. The nation was in the midst of unprecedented hard times and endemic unemployment. Surely the country stood to gain more by making use of its citizens’ talents—even if these appeared to have no value in the world of commerce—than it could by putting them on the dole and thus paying them not to work! So it was that the Works Progress Administration, Farm Services Administration and other federal agencies and programmes assumed a responsibility for nurturing American composers, dramatists, writers and artists. One of them, the film-maker Pare Lorentz, in 1936 wrote and directed his first documentary for the Farm Services Administration. This was The Plow that Broke the Plains. (Lorentz had managed to persuade Roosevelt to create a US Government Film Service.) The film was made on a tiny budget, a venture without antecedents. It was intended as a documentation of the Dust Bowl, the agricultural disaster that had befallen the Plains States in the midst of times that were already hard. It was to serve as a propaganda vehicle for the administration: Washington was finally taking steps to remedy the disasters that had resulted from generations of greed and abuse of the land. Lorentz’s creative team was integrally involved at every stage. Thomson’s music evolved with the film; sometimes the film was edited to the music, sometimes the music to the film. When it was first exhibited, The Plow created quite a sensation and achieved a degree of acceptance with the general film-going public that exceeded anything its film-makers, the Farm Services Administration or Hollywood could have envisaged. Its popular success had a number of consequences. One was the decision to make a second film, The River, which addressed itself to the Mississippi and the government’s efforts to redress the damage done by man. (Thomson scored this film also.) Another outcome that no one had predicted was an outcry from the commercial film community in Hollywood which saw Lorentz’s efforts as unfair government-inspired competition in the commercial marketplace. Hollywood increased its pressure until the Film Service was disbanded. The underlying theme of The Plow that Broke the Plains is that of American innocence and its betrayal; and Thomson is an archetypal American ‘innocent’—knowing, sophisticated, acutely intelligent but still paradoxically innocent, childlike, morning-fresh in his perception of the world. He discards post-Wagnerian hyperbole and egomania in favour of what Wilfrid Mellers called the ‘surrealistically childlike unsentimentality’ of Satie and his own grass roots, first and foremost Baptist hymnody. Grass: Pastorale: The grass lands … a treeless wind-swept continent of grass stretching from the broad Texas Panhandle up to the mountain reaches of Montana and to the Canadian border. A country of high winds and sun … high winds and sun … without rivers, without streams, with little rain. Cattle: First came the cattle … an unfenced range a thousand miles long … an unchartered ocean of grass, the southern range for winter grazing, and the mountain plateaus for summer. It was a cattleman’s paradise. Up from the Rio Grande … in from the rolling prairies … down clear from the eastern highways the cattle rolled into the old buffalo range. For a decade the world discovered the grass lands and poured cattle into the plains. The railroads brought markets to the edge of the plains … land syndicates sprang up overnight, and the cattle rolled into the West. Blues: Then we reaped the golden harvest … then we really plowed the plains … we turned under millions of new acres for war. We had the manpower … we invented new machinery. The world was our market. By 1933 the old grass lands had become the new wheat lands … a hundred million acres … two hundred million acres … more wheat!? Drought: A country without rivers … without streams … with little rain … once again the rains held off and the sun baked the earth. This time no grass held moisture against the winds and sun … this time millions of acres of plowed land lay open to the sun. Devastation: Baked out—blown out—and broke! Year in, year out, uncomplaining, they fought the worst drought in history … their stock choked to death on the barren land … their homes were nightmares of swirling dust night and day. Many went ahead of it—but many stayed until stock, machinery, homes, credit, food, and even hope were gone. On to the West! Once again they headed into the setting sun … once again they headed West out of the Great Plains and hit the highways for the Pacific Coast, the last border. Blown out, baked out and broke … nothing to stay for … nothing to hope for … homeless, penniless and bewildered they joined the great army of the highways. No place to go … and no place to stop. Nothing to eat … nothing to do … their homes on four wheels … their work a desperate gamble for a day’s labor in the fields along the highways, price of a sack of beans or a tank of gas … all they ask is a chance to start over and a chance for their children to eat, to have medical care, to have homes again. 50,000 a month! The sun and winds wrote the most tragic chapter in American agriculture. The last movement of the Louisiana Story ‘Suite’—the most dramatic episode in the score, and musically the most exciting (boy fights alligator and is saved only by the arrival of father)—is a fugue. The shapes of its principal subjects derive from the animal’s snapping, wriggling and writhing motions; there is devilry too (the augmented fourth, the medieval diabolus in musica) and it is typical of Thomson’s sophisticated innocence that he sees in fugue not what Barbirolli would have called a cerebral hangover, but a vehicle for passion and tension. So have many great composers from Bach and Handel onwards. And Thomson was always a willing contrapuntist: the suite from the 1958 Thorold Dickinson documentary Power Among Men is entitled ‘Fugues and Cantilenas’ and sits very happily in the immediate vicinity of the 1957 Lively Arts Fugue and the 1962 Joyful Fugue. Do the fugues in Power Among Men, for all their formality and consistency, look back in spirit to the ‘fuguing tunes’ of the late eighteenth-century New England hymnodists like William Billings? Since this was a salient part of Thomson’s heritage the answer is probably ‘yes’. And inasmuch as ‘cantilena’ is a term used for a passage of particularly sustained melodic or lyrical quality—vocal or instrumental—each of Thomson’s ‘fugues’ could legitimately be described as a ‘cantilena’. But all Thomson is really canto, song, singing: even ‘Ruins and Jungles’, ostensibly a mood piece, is really a chorale in disguise, and the ‘Joyous Pastorale’ is an instrumental dance-song. Qui dit films américains dit avant tout Hollywood. Pourtant, et c’est une bien curieuse histoire, aucune des partitions du présent recueil—œuvre de l’un des plus éminents compositeurs d’Amérique—ne fut écrite pour un film hollywoodien. Rares étaient, en effet, les tout premiers compositeurs pour films sonores à avoir des références universitaires ou intellectuelles comparables à celles de Thomson (en l’occurrence, Harvard et Nadia Boulanger). Un Steiner, un Newman ou un Victor Young avaient plutôt une formation axée «Broadway» ou «Tin Pan Alley» et, d’une manière ou d’une autre, ils évoluaient dans un contexte de musique «commerciale». Or, la musique «commerciale» est, en général, stylistiquement conservatrice: les musicals de Broadway naquirent ainsi de l’opérette au XIXe siècle; quant aux chansons populaires et à la musique légère, elles durent s’appuyer sur un vocabulaire que les gens ordinaires pouvaient aisément comprendre, auquel ils pouvaient accrocher—un schéma auquel adhérèrent les premières musiques de films hollywoodiennes et leurs compositeurs. Mais des hommes comme Copland et Thomson n’entrèrent pas dans ce moule. Peu attirés par le romantisme européen du XIXe siècle, ils s’intéressèrent surtout à l’authentique passé musical de leur pays, cherchant à créer une musique véritablement, fondamentalement américaine. Hollywood n’entendait rien à ce genre de musique «américaine», n’en voulait pas; de toute façon, la Californie était tellement éloignée, géographiquement, des autres grands centres culturels américains que les figures majeures de la culture d’alors—les Thomson, Copland et autres Bernstein—n’auraient jamais pu y travailler régulièrement, quand même les y eût-on invités. De plus, les studios hollywoodiens ne se satisfirent jamais vraiment des «cumulards»: ils ne rentraient pas dans le système. Résultat: une poignée de films hollywoodiens pour Copland, un seul pour Bernstein (On the Waterfront) et aucun pour Thomson. Des dizaines d’autres excellents compositeurs américains, tous éminents, auraient pu briller dans la musique de film mais, la situation étant ce qu’elle était, aucun ne put même essayer. Les films dont la musique est enregistrée ici furent produits en dehors d’Hollywood—Hollywood qui, dans le cas du premier d’entre eux, The Plow that Broke the Plains, en fut tout sauf content. Le chef d’orchestre Richard Kapp a expliqué comment ce film et d’autres du même genre découlèrent du New Deal du gouvernement Roosevelt et de sa tentative de résoudre l’écrasante série de problèmes économiques qui s’abattirent sur l’Amérique des années 1930, celles de la grande dépression. À l’origine des subventions gouvernementales sans précédent en faveur de musiciens, de cinéastes, d’artistes graphiques, d’écrivains et autres acteurs, une simple hypothèse: la nation, plongée dans des difficultés et un chômage endémique encore jamais atteints, gagnerait assurément plus à exploiter les talents de ses concitoyens—même s’ils semblaient sans valeur commerciale—qu’à mettre les gens au chômage et à les payer à ne rien faire! Du coup, la Works Progress Administration, la Farm Services Administration, ainsi que d’autres agences et programmes fédéraux, subvinrent aux besoins des compositeurs, dramaturges, écrivains et artistes américains. En 1936, l’un d’entre eux, le cinéaste Pare Lorentz écrivit et réalisa son premier documentaire pour la Farm Services Administration: The Plow that Broke the Plains. (Lorentz était parvenu à convaincre Roosevelt de créer un service cinématographique gouvernemental.) Réalisée avec un budget minuscule, cette aventure inédite se voulait une évocation du Dust Bowl, cette catastrophe agricole qui frappa les Grandes Plaines en des temps déjà difficiles. Le documentaire devait servir la propagande de l’administration: Washington prenait enfin des mesures pour remédier aux désastres engendrés par des générations de cupidité et d’abus envers la terre. L’équipe créatrice de Lorentz s’impliqua pleinement, à chaque étape, et la musique évolua avec le film—tantôt c’était le film qui était monté sur la musique, tantôt c’était l’inverse. Dès sa sortie, The Plow fit sensation et fut apprécié du grand public cinéphile bien au-delà de tout ce que ses concepteurs, la Farm Services Administration ou Hollywood eussent pu imaginer. Ce succès populaire n’alla d’ailleurs pas sans conséquences: décision fut prise, notamment, d’entreprendre un second film, The River, consacré au Mississippi et aux efforts déployés par le gouvernement pour rectifier les dommages infligés par l’homme. (La musique de ce film fut de Thomson.) Autre conséquence, que nul n’avait prévue: un tollé s’éleva du côté de la communauté des films commerciaux, basée à Hollywood, qui perçut les efforts de Lorentz comme une concurrence déloyale, sous inspiration gouvernementale, et accrut sa pression jusqu’au démantèlement du service cinématographique. Bétail: D’abord vint le bétail … des pâturages sans clôture sur mille miles … un océan non cartographié de prés, les prairies du Sud pour l’hivernage, les plateaux montagneux pour l’estivage. Le paradis du bouvier. Du Rio Grande … des prairies ondoyantes … des grandes routes de l’Est, le bétail déferla dans les bons vieux pâturages à bisons. Une décennie durant, le monde découvrit l’existence des prairies et déversa le bétail dans les plaines. Les voies ferrées amenèrent les marchés à la lisière des plaines … des groupements agricoles naquirent du jour au lendemain et le bétail déferla sur l’Ouest. Blues: Alors on récolta la moisson dorée … alors on laboura vraiment les plaines … pendant la guerre, on mit en culture des millions d’acres nouveaux. On avait la main d’œuvre … on inventa de nouvelles machines. Le monde était notre marché. En 1933, les bons vieux pâturages étaient devenus les nouvelles terres à blé … cent millions d’acres … deux cent millions d’acres … encore du blé!? Sécheresse: Une région sans rivière … sans cours d’eau … presque sans pluie … une nouvelle fois il ne plut pas et le soleil dessécha la terre. Mais cette fois, nulle herbe pour retenir l’humidité contre les vents et le soleil … cette fois, des millions d’acres de terre labourée furent offerts au soleil. Dévastation: Desséchés par le soleil, battus par les vents et sans le sou! Année après année, sans jamais se plaindre, ils luttèrent contre la pire sécheresse de l’histoire. Leur cheptel mourut étouffée sur le sol aride … leurs maisons furent des cauchemars de poussière, tourbillonnant nuit et jour. Beaucoup partirent à temps—mais beaucoup restèrent jusqu’à ce qu’il n’y eût plus ni cheptel, ni machine, ni maison, ni crédit, ni nourriture, ni même espoir. En route vers l’Ouest! Une fois encore, ils allèrent en direction du soleil couchant … une fois encore, ils mirent cap à l’Ouest à travers les Grandes Plaines et empruntèrent les grandes routes vers la côte Pacifique, l’ultime frontière. Battus par les vents, desséchés par le soleil et sans le sou … nulle part où rester … rien à espérer … sans abri, sans le sou, abasourdis, ils rejoignirent la grande armées des routes nationales. Nulle part où aller … et nulle part où s’arrêter … rien à manger … rien à faire … leurs maisons sur quatre roues … leur travail: une loterie désespérée pour une journée de labeur dans les champs bordant les grandes routes, prix d’un sac de haricots ou d’un bidon d’essence … tout ce qu’ils demandent, c’est de pouvoir prendre un nouveau départ, que leurs enfants puissent manger, recevoir des soins médicaux, retrouver un chez-eux. Cinquante mille par mois! Le soleil et les vents écrivirent les pages les plus tragiques de l’agriculture américaine. Le dernier mouvement de la «Suite» Louisiana Story—l’épisode le plus dramatique de la partition, le plus passionnant musicalement aussi (le garçonnet, aux prises avec un alligator, ne doit son salut qu’à l’arrivée de son père)—est une fugue. Ses principaux sujets tirent leur forme des brusques mouvements de torsion frétillante de l’animal; la diablerie est également présente (la quarte augmentée, le diabolus in musica médiéval) et, fait typique de sa naïveté sophistiquée, Thomson voit dans la fugue non ce que Barbirolli aurait appelé une survivance cérébrale mais—comme bien des grands compositeurs depuis Bach et Hændel—un véhicule de la passion, de la tension. Thomson fut toujours un contrapuntiste enthousiaste: la suite issue du documentaire Power Among Men de Thorold Dickinson (1958) s’intitule «Fugues and Cantilenas» et s’accomode avec bonheur du voisinage immédiat de Lively Arts Fugue (1957) et de Joyful Fugue (1962). Nonobstant leur caractère formel et cohérent, les fugues de Power Among Men ont-elles l’esprit tourné vers les «fuguing tunes» (NdT: chant ecclésiastique américain marqué par l’homophonie et l’imitation) des hymnodistes de la Nouvelle-Angleterre de la fin du XVIIIe siècle, tel William Billings? Comme il s’agit là d’une part incontournable de l’héritage de Thomson, la réponse est probablement oui. Et dans la mesure où «cantilène» désigne un passage vocal ou instrumental d’une qualité mélodico-lyrique particulièrement soutenue, chacune des «fugues» de Thomson pourrait être qualifiée, à raison, de «cantilène». Mais Thomson n’est véritablement que canto, que chant: même le prétendu morceau d’ambiance «Ruins and Jungles» est, en fait, un choral déguisé; quant à la «Joyous Pastorale», elle est en réalité un chant à danser instrumental. Wenn wir an amerikanische Filme denken, meinen wir in erster Linie Hollywood, aber nicht eine einzige Filmmusik der vorliegenden Zusammenstellung—das Werk eines der bedeutendsten Komponisten Amerikas—wurde für einen Hollywood-Film komponiert. Daran knüpft sich eine merkwürdige Geschichte. Kaum einer der ersten Tonfilmkomponisten Hollywoods hatte vergleichbare akademische bzw. intellektuelle Referenzen aufzuweisen wie Thomson (Ausbildung in Harvard und bei Nadia Boulanger). Männer wie Steiner, Newman und Victor Young hatten ihre Ausbildung eher am Broadway oder in der Tin Pan Alley genossen. Ihre berufliches Umfeld war „kommerzielle“ Musik der einen oder anderen Art. Und „kommerzielle“ Musik ist stilistisch im allgemeinen konservativ: Broadway-Musicals sind aus der Operette des neunzehnten Jahrhunderts hervorgegangen; Schlager und Unterhaltungsmusik mussten sich eines Vokabulars befleißigen, das normale Menschen ohne weiteres verstehen konnten und das ihnen etwas sagte. Das gleiche galt für die ersten Hollywood-Filmmusiken und deren Komponisten. Männer wie Copland und Thomson entsprachen nicht diesen Voraussetzungen. Die europäische Romantik des neunzehnten Jahrhunderts sagte ihnen nicht zu. Sie interessierten sich mehr für die authentische musikalische Vergangenheit ihres eigenen Landes, wollten echt amerikanische Musik schaffen, essentiell amerikanische Musik. Hollywood hatte kein Verständnis für dergleichen „amerikanische“ Musik und wollte sie nicht haben, und natürlich war Kalifornien geographisch so weit von anderen wesentlichen kulturellen Zentren Amerikas entfernt, dass bedeutende Persönlichkeiten des Kulturbetriebs—Leute wie Thomson, Copland, Bernstein—dort nie regelmäßig tätig gewesen sein könnten, selbst wenn man sie dazu aufgefordert hätte. Außerdem hatten die Hollywood-Studios für „Nebenberufler“ nie viel übrig, sie passten nicht ins System. So ergab es sich, dass Copland an nicht mehr als einer Handvoll Hollywood-Filme mitgearbeitet hat, Bernstein an nur einem (On the Waterfront) und Thomson an gar keinem. Und es gab noch Dutzende weiterer prominenter und hervorragender amerikanischer Komponisten, die im Filmmusikgenre ausgezeichnete Arbeit hätten leisten können, jedoch in der damaligen Situation nie Gelegenheit erhielten, sich daran zu versuchen. Die Filme, deren Musik hier aufgezeichnet wurde, sind unabhängig von Hollywood entstanden, und im ersten Fall, The Plow that Broke the Plains, war Hollywood darüber alles andere als glücklich. Der Dirigent Richard Kapp hat erklärt, dass dieser Film und andere seiner Art dank der Versuche der „New-Deal“-Regierung Roosevelts zustande gekommen sind, die verheerenden wirtschaftlichen Probleme zu lösen, die in den 1930er-Jahren Amerika zu schaffen machten, zur Zeit der Weltwirtschaftskrise. Das nie dagewesenen Engagement der Regierung, ihre Unterstützung von Musikern, Filmemachern, Grafikern, Schriftstellern, Schauspielern und anderen, beruhte auf einer schlichten Hypothese: Die Nation erlebte beispiellos harte Zeiten samt weit verbreiteter Arbeitslosigkeit. Da nützte es dem Land doch mehr, sich die Fähigkeiten seiner Bürger zunutze zu machen—selbst wenn sie auf den ersten Blich keinen wirtschaftlichen Nutzen erbrachten—, als ihnen Arbeitslosengeld zu zahlen und sie mithin dafür zu entlohnen, dass sie nicht arbeiteten! So kam es, dass die Bauverwaltung, das Landwirtschaftsamt und andere staatliche Behörden und Programme die Verantwortung dafür unternahmen, amerikanische Komponisten, Dramatiker, Schriftsteller und bildende Künstler zu subventionieren. Einer der Betroffenen, der Filmemacher Pare Lorentz, schuf 1936 als Drehbuchautor und Regisseur seinen ersten Dokumentarfilm für das Landwirtschaftsamt. Es war dies The Plow that Broke the Plains. (Lorentz hatte Roosevelt überreden können, eine Filmbehörde der US-Regierung ins Leben zu rufen.) Der Film wurde mit niedrigem Budget gedreht, ein noch nie dagewesenes Unterfangen. Er war als Dokumentation der Dust Bowl gedacht, der landwirtschaftlichen Katastrophe, der inmitten ohnehin harter Zeiten die Präriestaaten anheim gefallen waren. Er sollte als behördliches Propagandamittel eingesetzt werden: Washington leitete endlich Schritte ein, um den Missernten abzuhelfen, die auf jahrzehntelang herrschende Habgier und Missbrauch des Landes zurückzuführen waren. Lorentz’ künstlerischer Stab war an jedem Stadium des Projekts wesentlich beteiligt. Thomsons Musik entwickelte sich mit dem Film; mal wurde der Film passend zur Musik geschnitten, mal die Musik, damit sie zum Film passte. Als er zum ersten Mal gezeigt wurde, löste The Plow eine erhebliche Senation aus und wurde vom Kinopublikum in einem Maß akzeptiert, das über alles hinaus ging, was die Filmemacher, das Landwirtschaftsamt und Hollywood hätten erwarten können. Sein Publikumserfolg hatte mehrere Konsequenzen. Eine davon war die Entscheidung, einen zweiten Film mit dem Titel The River zu drehen, der vom Mississippi und den Bemühungen der Regierung handelte, die vom Menschen angerichteten Schäden zu beseitigen. (Thomson hat auch zu diesem Film die Musik komponiert.) Eine andere Folge, mit der niemand gerechnet hatte, war ein Aufschrei der kommerziellen Filmgemeinde in Hollywood, die Lorentz’ Arbeit als von der Regierung geförderten unlauteren Wettbewerb auf dem freien Markt ansah. Unter dem stetig wachsenden Druck Hollywoods wurde der Filmdienst schließlich aufgelöst. 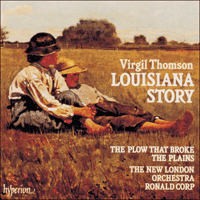 Das Grundthema von The Plow that Broke the Plains ist die Unschuld Amerikas und der an ihr begangene Verrat; Thomson ist der urtypische amerikanische „Unschuldige“—kenntnisreich, kultiviert, hochintelligent, zugleich jedoch paradoxerweise unschuldig, kindlich, frisch wie der junge Morgen in seiner Wahrnehmung der Welt. Er sagt sich los von Übertreibung und Egomanie im Stile Wagners zugunsten der „surrealistisch kindlichen, unsentimentalen Haltung“ Saties, wie Wilfrid Mellers schreibt, und seiner eigenen musikalischen Prägung vor allem durch den baptistischen Kirchengesang. Grass: Pastorale: Das Grasland … eine baumlose, windzerzauste, grasbewachsene Region, die sich vom Panhandle in Texas hinauf zu den Bergen Montanas und bis zur kanadischen Grenze erstreckt. Ein Land der starken Winde … der starken Winde und der Sonne … ohne Flüsse und Bäche, mit geringen Niederschlägen. Cattle [Vieh]: Zuerst kam das Vieh … unumzäuntes Weideland, eintausend Meilen lang, ein unerforschtes Grasmeer, der Süden zum Grasen im Winter, die Hochebenen für den Sommer. Ein Paradies für den Viehzüchter. Hinauf vom Rio Grande … von der wogenden Prärie her … hinab in sicherer Entfernung von den östlichen Highways breitete das Vieh sich auf der ehemaligen Büffelweide aus. Ein Jahrzehnt lang entdeckte die Welt das Grasland und trieb Vieh in die Ebenen. Die Eisenbahn brachte Märkte an den Rand der Prärie … Landsyndikate entstanden über Nacht und das Vieh strömte in den Westen. Blues: Dann brachten wir die goldene Ernte ein … Dann machten wir uns ans Pflügen der Prärie … Millionen Morgen Land wurden des Krieges wegen frisch umgegraben. Wir hatten die Arbeitskräfte … wir erfanden neue Maschinen. Die Welt war unser Markt. Um 1933 war aus dem alten Weideland neues Weizenland geworden … einhundert Millionen Morgen … zweihundert Millionen Morgen … Immer mehr Weizen!? Drought [Dürre]: Ein Land ohne Flüsse … ohne Bäche … mit geringen Niederschlägen … Wieder einmal blieb der Regen aus und die Sonne versengte den Boden. Nun gab es kein Gras mehr, um die Feuchtigkeit vor Wind und Sonne zu schützen … Nun waren Millionen Morgen gepflügte Felder der Sonne ausgesetzt. Devastation [Verwüstung]: Verdorrt—verweht—und pleite! Jahr ein, Jahr aus kämpften sie klaglos gegen die schlimmste Dürre aller Zeiten an … Ihr Vieh erstickte auf dem Ödland … ihre Behausungen waren Tag und Nacht dem alptraumhaft wirbelnden Staub ausgesetzt. Viele flohen, ehe es schlimm wurde—aber viele blieben auch, bis Vieh, Maschinerie, Heim, Kredit, Lebensmittel und auch noch die letzte Hoffnung dahin waren. Auf in den Westen! Wieder einmal zogen sie der untergehenden Sonne entgegen … Wieder einmal machten sie sich westwärts auf, aus den Prärien nahmen sie die Fernstraßen in Richtung auf die Pazifikküste, die letzte Grenze. Verweht, verdorrt und pleite … nichts, wofür es sich zu bleiben lohnte … nichts, was hoffen ließe … Heimatlos, mittellos und verwirrt gesellten sie sich zu dem großen Heer auf den Fernstraßen. Ohne Ziel … und ohne Rast. Nichts zu essen … nichts zu tun … Ihre Heimstatt auf vier Rädern … ihr Broterwerb das verzweifelte Spekulieren auf einen Tag Arbeit auf den Feldern entlang der Straße, um den Preis eines Sacks Bohnen oder eines Tanks voll Benzin … Sie wollen nichts als die Chance auf einen Neubeginn—dass ihre Kinder etwas zu essen bekommen, ärztliche Versorgung und ein Dach über dem Kopf. Jeden Monat 50 000! Die Sonne und der Wind schrieben das tragischste Kapitel in der Geschichte der amerikanischen Landwirtschaft. Der letzte Satz der „Suite“ aus Louisiana Story—die dramatischste Episode der Partitur, und musikalisch die aufregendste (der Junge kämpft mit einem Alligator und wird nur durch das Eintreffen seines Vaters gerettet)—ist eine Fuge. Die Form ihrer Hauptthemen ist aus dem Schnappen, Winden und Schlängeln des Tiers hergeleitet; es ist auch Teufelei im Spiel (die übermäßige Quarte, der mittelalterliche diabolus in musica), und es ist typisch für Thomsons kultivierte Unschuld, dass er in der Fuge nicht das sieht, was Sir John Barbirolli intellektuelle Verkaterung genannt hätte, sondern ein Vehikel für Leidenschaft und Spannung, so wie viele große Komponisten seit Bach und Händel. Und Thomson war stets ein bereitwilliger Kontrapunktiker: Die Suite aus Thorold Dickinsons Dokumentarfilm Power Among Men von 1958 trägt den Titel „Fugen und Kantilenen“ und steht durchaus ebenbürtig neben der Lively Arts Fugue von 1957 und der 1962 entstandenen Joyful Fugue. Blicken die Fugen in Power Among Men bei aller Förmlichkeit und Konsequenz im Geiste zurück auf die „fugierenden Weisen“ von Hymnenkomponisten wie William Billings, die Ende des achtzehnten Jahrhunderts in Neuengland tätig waren? Da diese ein bedeutender Teil von Thomsons Erbe waren, lautet die Antwort wahrscheinlich „ja“. Und insofern „Kantilene“ als Bezeichnung für eine Passage von ausgehaltener melodischer oder lyrischer Qualität—in der Vokal- ebenso wie in der Instrumentalmusik—gelten kann, ließen sich sämtliche „Fugen“ Thomsons ganz legitim als „Kantilenen“ beschreiben. Doch bei Thomson ist eigentlich alles canto, Lied, Gesang: Selbst „Ruins and Jungles“, vorgeblich ein Stimmungsbild, ist in Wahrheit ein getarnter Choral, und die „Joyous Pastorale“ ist ein instrumental dargebotenes Tanzlied.